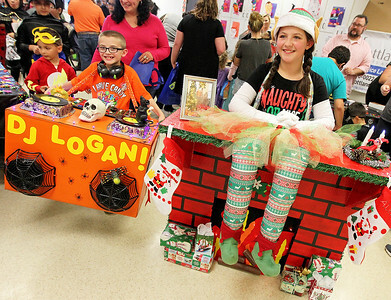 Candace H. Johnson-For Shaw Media Logan Carey, 7, of Round Lake, dressed as a D.J., and his sister, Alena, 10, dressed as an Elf on a Shelf, make their way through the Great Pumpkin Celebration at the Round Lake Area Park District’s Robert W. Rolek Community Center in Round Lake. Candace H. Johnson-For Shaw Media Bianca Thornberry, 4, of Round Lake Beach plays the Bats in the Tree game during the Great Pumpkin Celebration at the Round Lake Area Park District’s Robert W. Rolek Community Center in Round Lake. 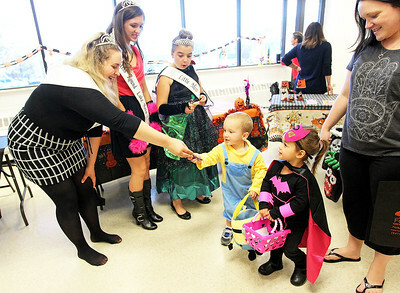 Candace H. Johnson-For Shaw Media Miss Round Lake Area Shelby Brubaker, 18, stands next to Junior Miss Jaina Castiglia, 12, and Little Miss Cayden Zeller, 9, as she hands out candy to Dominic DeFilippis, 2, and Ella Besario, 3, both of Kenosha, Wis., during the Great Pumpkin Celebration at the Round Lake Area Park District’s Robert W. Rolek Community Center in Round Lake. 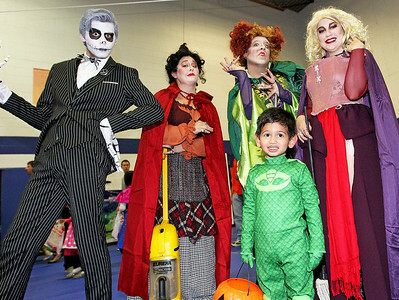 Candace H. Johnson-For Shaw Media Vihaan Garg, 3, of Round Lake gets his photo taken as he stands next to the Pumpkin King and Salem Witches during the Great Pumpkin Celebration at the Round Lake Area Park District’s Robert W. Rolek Community Center in Round Lake. 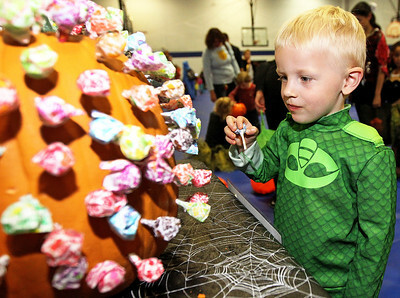 Candace H. Johnson-For Shaw Media Blake Johnson, 3, of Salem, Wis., gets a lollipop from the Sucker Pull during the Great Pumpkin Celebration at the Round Lake Area Park District’s Robert W. Rolek Community Center in Round Lake. 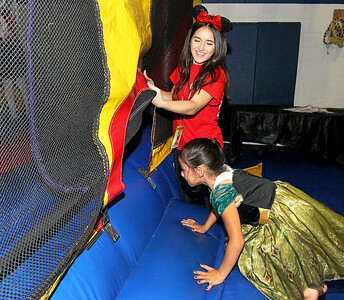 Candace H. Johnson-For Shaw Media Violet Ochoa, 17, of Round Lake Beach helps kids into the Bounce House during the Great Pumpkin Celebration at the Round Lake Area Park District’s Robert W. Rolek Community Center in Round Lake. 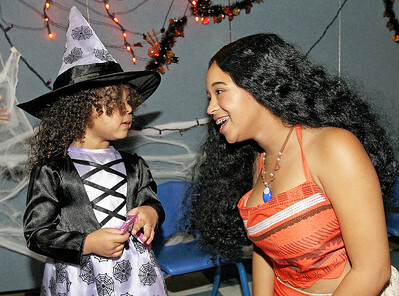 Ochoa was an attendant for Bella's Bouncies. 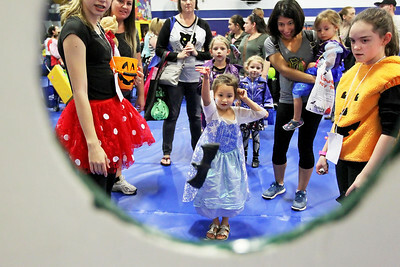 Candace H. Johnson-For Shaw Media Isabella Carmona, 4, of Round Lake Park visits Mae Metka, 17, of Round Lake, as Moana, during the Great Pumpkin Celebration at the Round Lake Area Park District’s Robert W. Rolek Community Center in Round Lake. 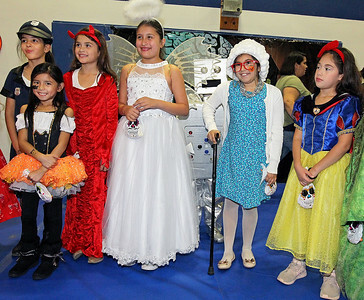 Candace H. Johnson-For Shaw Media Julie Cardenas, 9, of Waukegan, (second from right) dressed as a grandma, stands close to others as they all show off their costumes in the Costume Contest for ages 7-9 during the Great Pumpkin Celebration at the Round Lake Area Park District’s Robert W. Rolek Community Center in Round Lake. 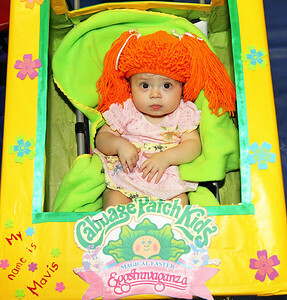 Candace H. Johnson-For Shaw Media Mavis Dougherty, nine-months-old, dressed as a Cabbage Patch Kid for the Costume Contest and won first place for ages 0-3 during the Great Pumpkin Celebration at the Round Lake Area Park District’s Robert W. Rolek Community Center in Round Lake. 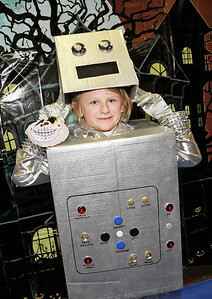 Candace H. Johnson-For Shaw Media Patrick Dauray, 7, of Round Lake lifts up his robot mask during the Great Pumpkin Celebration at the Round Lake Area Park District’s Robert W. Rolek Community Center in Round Lake. 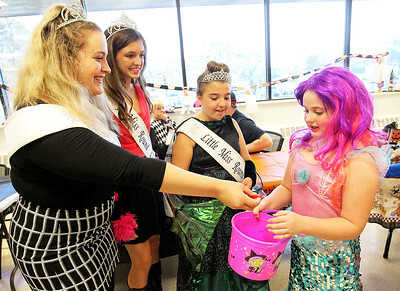 Candace H. Johnson-For Shaw Media Miss Round Lake Area Shelby Brubaker, 18, stands next to Junior Miss Jaina Castiglia, 12, and Little Miss Cayden Zeller, 9, as she hands out candy to Ava Timm, 8, of Spring Grove during the Great Pumpkin Celebration at the Round Lake Area Park District’s Robert W. Rolek Community Center in Round Lake. Bianca Thornberry, 4, of Round Lake Beach plays the Bats in the Tree game during the Great Pumpkin Celebration at the Round Lake Area Park District’s Robert W. Rolek Community Center in Round Lake.